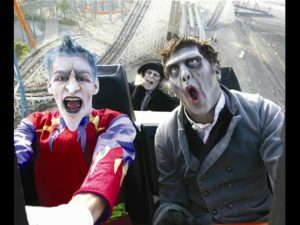 Many of the big theme-park haunts are creaking open their gates this weekend and we’ve carefully assembled some Terror Tips for getting the most screams and bang for your buck out of the night. As you begin your planning and preparation for the season of the witch, this list of tips will help you experience every maze, attraction, and maybe even the dumb shows at these mega-haunts. So pay attention, please. We don’t want you or your money to be left behind. Trust us, we know how to Haunt Stalk. This is the number one tip. Seriously, if you follow only one recommendation on this page, this should be the one. This will make or break your entire night. TRUST US. Get there before the haunt opens; we recommend at least a half-hour early. Remember you need to plan time for parking and to get through any security checks so you can queue up to get inside at opening. Some haunts will actually start letting people in before the posted official opening time. 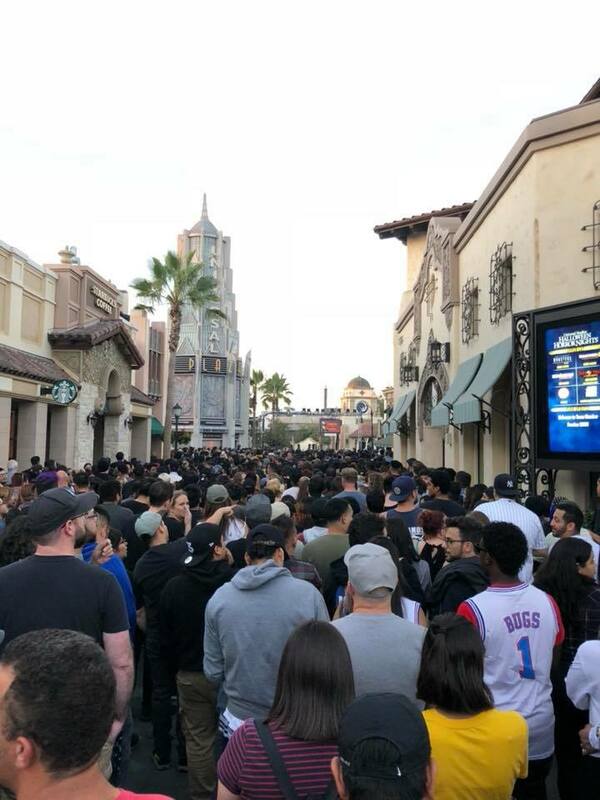 Universal has started opening some haunts as early as 5pm. If you get there early you might be able to go into a maze with almost no one else in it. Other haunts have “opening scare-amonies” that are worth watching and set the mood for the night (but skip them if you can get into the mazes ahead of the crowds). At Knott’s Scary Farm we’ve been able to get into three mazes within the half-hour before the haunt even opens, and we’ve never bought the early entry or “pre-scare dinner” option. Related to this: Buy your tickets in advance if you can. Waiting in line for tickets wastes valuable time. Why add another queue to your night? Haunts get more crowded the closer it gets to Halloween. They hit their peak on the weekend before Halloween. We suggest attending as close to the opening weekend as possible. The actors are also fresh and ready to scare. We’ve witnessed “monster fatigue” when we’ve gone near the end of haunt season, when we’ve noticed monsters talking to each other inside the maze or drinking a soda as they lean against a wall. The only downside with attending early in the season is that some scares might not be completely worked out, and actors might just be finding their groove. 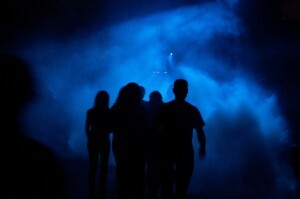 The second or third weekend of a haunt is usually the best time to visit. 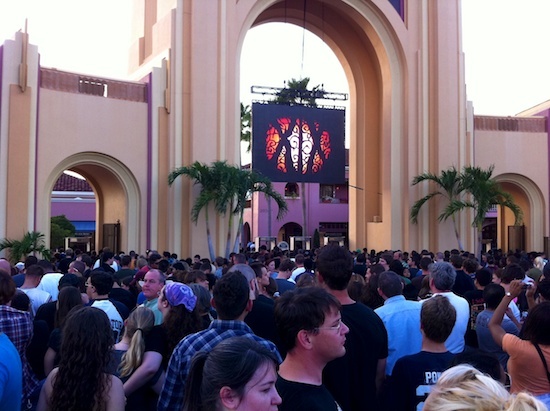 From our experiences, you’ll find much shorter lines by going to haunts that are open on Wednesday and Sunday nights. Thursdays can be lighter earlier in the season. However, do pay attention to the local school holidays as those can have a significant impact on the crowds’ sizes during these “off nights” as the haunt will be filled with pre-teen brats who were dropped off by their parents so that the ghost and ghouls can babysit them for the night. The Sunday before Columbus day is especially risky. …if you insist on ignoring the previous tip. Perhaps this tip should have been titled “Avoid Friday and Saturday Nights,” but we know that’s not realistic for most people. Work and school get in the way of attending haunts during the week. Sunday night could be a good compromise—lines will be much shorter, and you’ll still be able to arrive early (see tip #1) to avoid more of the crowds (your co-workers are used to seeing you looking hungover on Mondays anyway). But if you absolutely must go on a Friday or Saturday night, we recommend upgrading your ticket to a “Front-of-the-Line” pass (don’t forget to buy in advance!). Time is money, however, we realize that these passes can be pricey, so if you follow the other tips, you might be able to bypass the upgraded ticket and still see everything. After all, there are a lot of great haunts to attend, and you don’t want to blow your budget on a single ticket. With the terrors of the real world growing rampant, the security measures at many of these haunts has increased significantly. With this increased security comes annoying policies and rules that can make it even more time consuming, difficult, or even preventative for you getting inside; even if you have no intentions of being a haunt evildoer. Therefore, bone up on the rules at the respective haunts before you arrive. You don’t want to be the one who has to go all the way back to your car to return your forbidden camera, spiked jewelry, or switchblade. 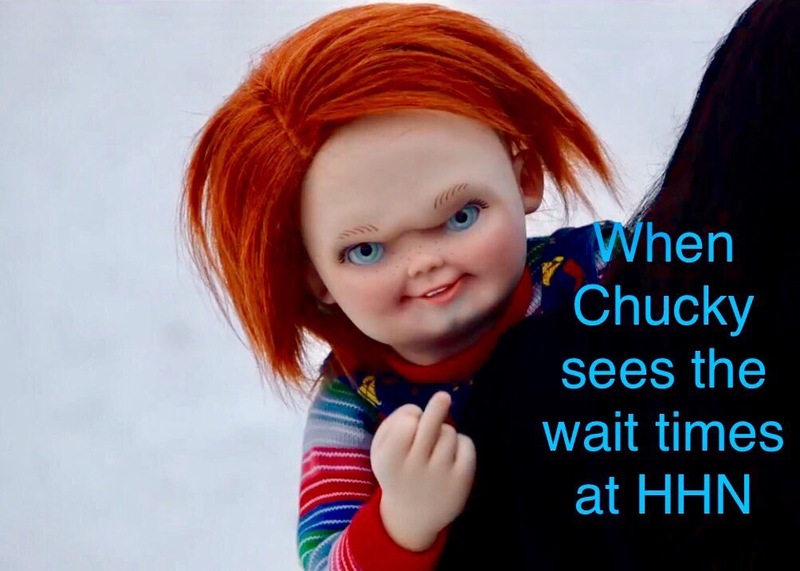 We also suggest that you travel light as there’s usually express lines for Haunt Stalkers who aren’t trying to enter with purses, bags, clothes (j/k), etc. Anyway, you’re just going for a night and not moving in… unless the haunts choose you to fill their residency quota. Do you really want to wait in line for a crappy hot dog that costs $8? No, you don’t. As part of the “GO EARLY” plan, you should have an early dinner near the park. 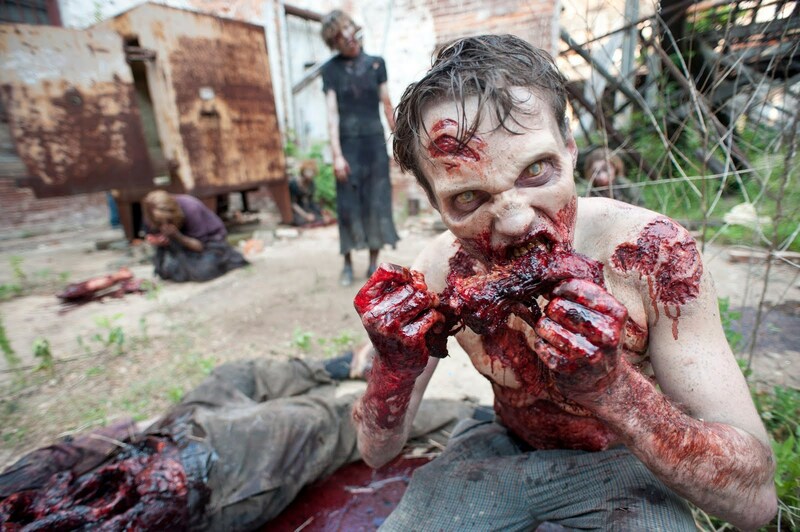 If you get hungry, grab a snack and eat in line. Don’t waste valuable time queuing up for theme park food. On the other hand, you could also wait and eat afterward. For example, Knott’s usually has a “midnight breakfast buffet” (12 am to 3 am) at the Chicken Dinner Restaurant next to the park that might be a good option. “The More the Merrier” does not apply to haunts. Hitting all the mazes, scare zones, shows, and rides in a single, crowded night requires coordination, and the more people you have in your group, the less likely it is that consensus will be reached about where to go and what to do. Some people will want to go on the rides first, some will want to hit the mazes, some might be hungry and want food (see #3 above). We recommend keeping your group to no more than 6 people unless you’re willing to accept that you won’t get to do everything. Note: this works only if you’ve arrived early. You might think going straight to the mazes in the back of the park is a good idea, but you’re wrong. Sure, there will be no one in the back when you get there, but when you circle back to the mazes in the front of the park, they’ll be packed. Almost everyone else will be working from front to back, so as long as you’re ahead of the pack (by getting in early, see #1 above), this approach works best. If you’ve arrived late, forget it. You’re screwed, no matter what approach you take. As a side, with Universal Hollywood’s unconventional layout they tend to allow early entry for the mazes in the lower lot, at the back of the park, so follow this plan doing the first mazes you encounter on the lower lot and then keep working your way to very back. You’ll likely get through all those mazes, which is a majority of them, with a significantly reduced wait time. Just be prepared to wait a little longer for the few on the upper lot. However, your overall wait time for the night should be reduced with this plan. … well only if you’re talking about our website. You will most likely pass through the scare zones as you make your way to the mazes. This absolutely adds to the overall experience but don’t get caught up hanging in the scare zones until you’ve already been through all the mazes/houses. As while you’re busy running away from and taking #selfies with a ghoul, the crowds will be surging past you and filling up the #longlines. You can always go back later in the night and leisurely scream through the scare zones. It’s Halloween season, and mazes/houses are the main attraction. These are open only 5 or 6 weeks at most during the year. You can go back and to get on all the coasters and E-Ticket rides some other time. And let’s face it, most shows at haunts are pretty terrible. Save all of these “dis-ttractions” for last, or at least until after you’ve hit all the mazes you really wanted to go through. Most Importantly Remain Calm and Happy Screaming! The 17th Door Haunted House Returns with Crybaby! Very sound advice. Strange, how often I forget it, in the excitement of attending a big event – especially the part about starting in the back and working forward. Used to be easier when Knott’s Scary Farm left their back entrance open. Hi this is Yadira and I was wondering for haunt nights if you can go on all the rides too and not just mazes and shows? 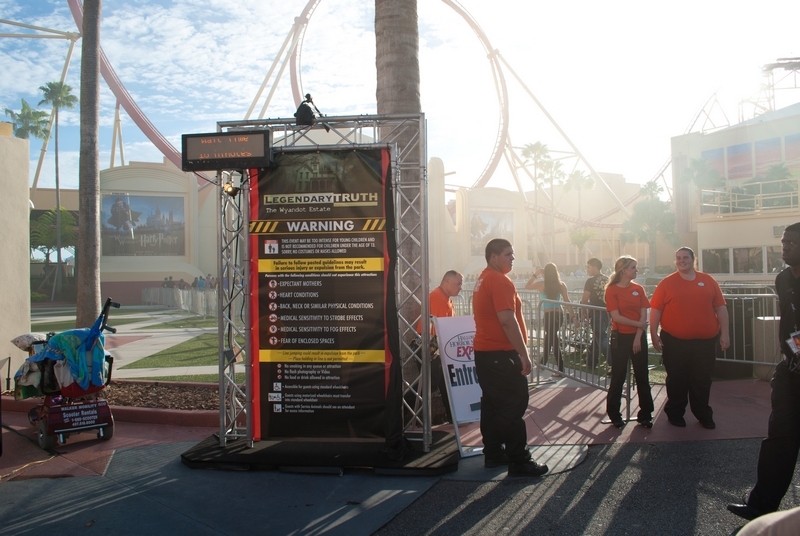 At most theme parks, you’ll be able to go on most of the rides during haunts nights. Some parks might shut down certain attractions, so it’s a good idea to check their website before you go. Just go at another time if you want to go on rides. – Tip #10. My friend’s really want to go to a haunted house, and I really would like to make this a really fun experience. Thank you for all the tips on how we can make it a really great night. I like your tip about keeping our group small. I think it would be good to keep the group small so we all can agree on what to do.